The Fleabag riders are Mantic Games' take on the classic Goblin Wolfriders, if you followed fleabag's riders design evolution you already noticed that the actual miniatures looks different from the original concept. Mantic redesigned the model in order to re-use their existing Mawbeast (a nasty predator that is basically their version of the beloved GW Squig). For general considerations about packing and material you can check the Ogre review I did before, for details about the Fleabag riders keep reading! Assemble the models will take time, I put together 10 of them in about an hour. 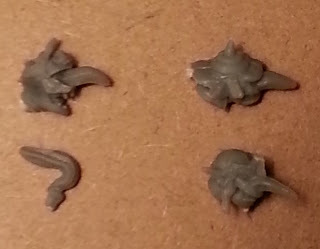 There are lots of small pieces (like the Mawbeasts tongues...) and some of the small pieces have some nasty molding lines that takes time to be cleared. I haven't said that before but plastic glue will not work on this, you have to use super glue. Mine had also some gaps between the goblin body and the mawbeast ride, so I had to use some green stuff to close the gaps. If you are thinking about converting the fleabag riders into a mawbeast unit I have some bad news for you, It is possible but it will take some time and skill. The mawbeast ride has half of the goblin rider legs attached to its back, if you want to get rid of the rider you have to cut off this part. After that you will have to use some green stuff to sculp the fur on the mawbeast back. 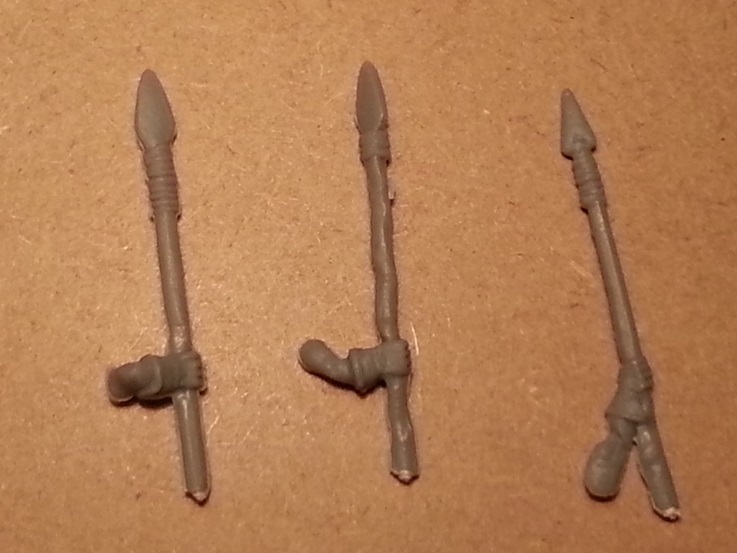 Speaking about convertions you could use some of the leftovers of this kit (about 5 heads and 5 spears in my case) to convert Mantic's plastic Goblin archers into Goblin spearmen (or speargoblin?!). There is no command group bits in the package I received, I'm not sure if Mantic will sell them separately (like they did for the Ogres) or it will be available in the retail box. Anyway the command group bits are made in Metal and not in plastic, you could use it to make some characters (Wiz, Biggit and Flaggit) on fleabag's back for example. Mantic has another version of the kit with goblin archers, in that case the goblin archers are made of metal and they are basically and add on to this kit (just the rider changes, the rest of the model it's the same. 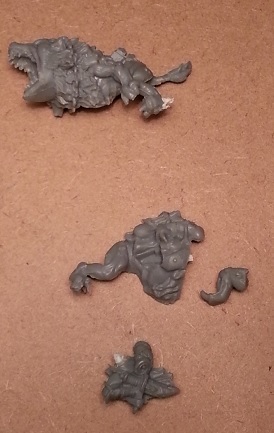 There are two mawbeast's body alternatives, each is composed by two halves (one has the goblin rider legs attached unfortunately) and the other half of the goblin legs are on a different sprue. There are 5 mawbeasts body like this in the kit. This is the second mawbeast body alternative, it has an extra component (the mawbeast paw). Rider's Body This is the upper body of the goblin riders available in two variants (there are 5 of each in the kit). 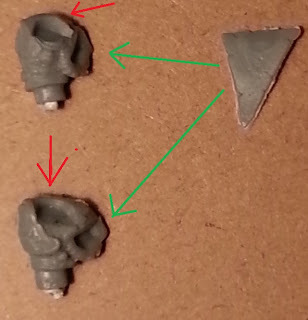 The shield goes in the slot in the right (green arrow) and the head goes on the top (red arrow). There is a peg on the bottom that goes into the ride. Three heads types are available in the kit, and there are 5 of each (it means you have 5 extra heads). The one on the left has also a decoration on the top pictured just below in this image. The quality of them is better than the goblin heads available in the infantry sprues, there is much more details. Spears The kit has three different spears designs and there are 5 of each types. (it meas you will have 5 extra spears left). As a note some of them were badly bended so I had to warm them up with hot water (almost boiling) in order to restore their shape. I like how they are both vicious and comical at the same time. My only complaint is the shield is part of the model and not separate. I am using the fleabag riders as wolf raiders for a chaos dwarf army for Warhammer and giving them shields means they are no longer fast cavalry... I was forced to greenstuff new arms onto them.. I agree with you, I would have used a more modular design approach i.e. keeping the rider as a completely separate model and giving to the rider separate arms for more customization. It might be that a more modular approach would add to the cost of the kit. Mantic are walking a very tricky path, offering a relatively low price by holding off on options and ease of conversion. It's a balance. Still, pointing out places we think they could improve does make sense. It may be as simple as them putting in place a second- and third-guesser for each proposed release, someone who can say something like 'yes, this solution does work, but if we switch this approach for that, we'll be offering even more'.